Comfort and beauty are combined nicely in this 2-bedroom Breckenridge condo located near the Valdoro Mountain Lodge. Completely renovated with all-new bathrooms, granite counter tops, updated cabinets and doors, you can relax at home and take in stunning views of Peaks 8, 7 and 6. This Breckenridge condo also features a working fireplace, brand new wood trim and wood cove ceilings, which provide a cozy ambiance for you and your family. Plus, your privacy is guaranteed with lock-off access to the 6th floor of Building 3, one of the most popular sites in the development. This ski-in-ski-out location also includes cable television, internet, Wi-Fi, a fitness room, hot tub and on-site management. This Breckenridge condominium provides the best of indoor comforts as well as access to the outdoor beauty of mountain living. Breckenridge is famous for its locally owned shops and restaurants, which are a big part of why Breckenridge is such a beloved town in Summit County. However, there is much more to Breckenridge that draws residents and visitors alike. One important distinction is that it is a popular niche for second homeowners. Almost 90 percent of property owners in Breckenridge have second homes or are investors in real estate, so if this condo is a vacation or weekend home for you, you’ll be in good company. Breckenridge’s location fosters a straightforward commute to Denver, Colorado Springs, Fort Collins and other Front Range areas, and it’s a great place for weekend getaways. With its unique access to lake activities, the mountains and ski areas, Breckenridge real estate offers appealing value for people who enjoy active, outdoor lifestyles as well. If you need one more reason to consider purchasing this picturesque Breckenridge condo, consider the community you’ll be joining: one that loves mountain life and is invested in protecting all the wonderful scenery and activities Breckenridge has to offer. If you’d like to learn more about Summit County real estate check out my website for updated listings. Listings can move quickly in and around Breckenridge, and I’m happy to arrange a call or an in-person meeting if you’re looking to buy or sell a home in the area. 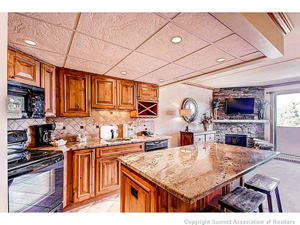 To visit this condo or other properties in the Breckenridge market, get in touch and I’d be glad to set up a showing. For buyers, I also suggest checking my Kelli Sells Blog for information on buying or selling homes in Summit County. I cover helpful tips on the buying process as well as notes on Summit County neighborhoods and listings. If you have questions at any point, send me an email at [email protected] or call my office line. I’m always ready to help you find your perfect home in Summit County.